A recurrent theme in our law and politics is state concern about individual citizens going overseas to fight in foreign wars, see here. Though present concerns focus on the radicalization of potential terrorists, even prior to Confederation, Canadians regularly participated in external conflicts. One of the best examples of Canadians fighting abroad was Calixa Lavallée, who penned 'O Canada' (with its own "Strange History" ), and who also fought and shed blood for the Union side in the American Civil War, see here. What to do about these individuals has presented an ongoing legal problem for the state, as discussed by Craig Forcese in his 2014 blog, here. 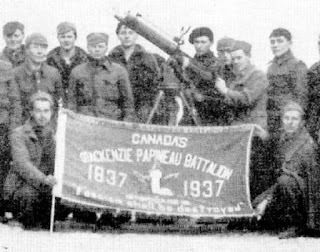 While many Canadians have participated in foreign wars before and since, see here, one of the least remembered conflicts is the Spanish Civil War. The war started in 1936, after portions of that country's military, dubbed the 'Nationalists', rebelled against the election of a left-leaning government popularly known as the 'Republican' or 'Loyalist' side. As has often been the case, the conflict on the Iberian peninsula appealed to many who saw a chance to fight for a cause. The Spanish Civil War was no different. Almost 40,000 volunteers formed an 'International Brigade' of soldiers from countries around the world, including the USA and Canada, who travelled to defend the elected government against the rising fascist menace. However, suspicious of their political motivations (many were communists), Mackenzie King's Liberal government passed the Foreign Enlistment Act in 1937, designed to criminalize the involvement of Canadian "Renegades" who wanted to fight (a version of which remains on the books, see here). Despite this, the Spanish Civil War of 1936 - 1939 attracted more than 1600 Canadian recruits, mostly men, but a few women too - see "My God, Are They Sending Women?" Canadians formed their own unit, the Mackenzie-Papinou Battalion, (the 'Mac-Paps'), named in commemoration of the leaders of the Rebellion of 1837, who had revolted a hundred years earlier. Almost half of the Mac-Paps ultimately lost their lives in the fight, more casualties than were experienced in the officially sanctioned conflict in Korea a few years later. Some combatants, like Canadian Dr. Norman Bethune, became famous around the world. But many, like George Hill, remained relatively unknown, and until very recently, not well recognized for their time in combat. Born in 1908, my Uncle George was my maternal grandmother's younger brother. I had the privilege of meeting him in person once in the 1970s, and have been lucky enough to find some records of his experience in Spain in the 1930's at an excellent site established with funding support from Canada's Social Sciences, Humanities and Research Council, see here. 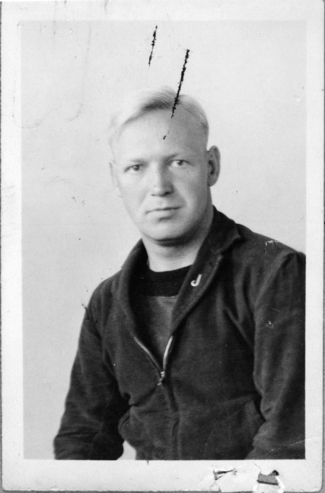 Given the high mortality rates, my Uncle was lucky to survive, especially so since he was captured in 1938 (on the 1st, April Fool's Day) and held as a Prisoner of War for 10 months. At some point he took the time to write a testimonial about his time in captivity. In his own handwriting, he tells an extra-ordinary tale of survival at the hands of the Nationalists, who regularly beat the imprisoned men with sticks, in terrible conditions. He notes, for example, eight of the international prisoners held by the Spanish died for lack of care in the "concentration camp" where they were kept, at San Pedro de Cardena. All were regularly subjected to interrogation by the Nazi German allies of the Spanish fascist regime. At one point George writes, "yes! It was the Gestapo", as if to dispel any doubt as to the identity of the foe that would shortly menace the whole world. His entire account is available online, see here. Released in a prisoner exchange in 1939, he ended his narrative with a cautionary warning that, within months, proved all too prescient, "they have left an impression on my mind & anything connected with fascism will always be my bitterest enemy." 2017 marks the 80th anniversary of the creation of the Mac-Paps, though I've seen little to mark this important date. 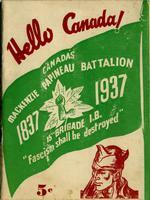 As I've noted before, Canadian history unfortunately often seems subject to political sensibilities, see here. In this case, when the soldiers returned from Europe in 1939, Spanish veterans were distrusted, and watched by the RCMP who deemed them, in language I'm sure George Orwell (who wrote his own account of the war - see here) would have appreciated, as "premature anti-fascists." Not much changed for over 60 years. Though the veterans of the Spanish War sought recognition for decades, see here, Canadian governments consistently refused to acknowledge these soldiers. In 2001, Canadian veterans of the Spanish Civil War got a national monument in the nation's capital, though as reported in this CBC clip, it had to be paid for by private donations. One of the very last Canadian veterans of the war, Jules Paivio died in 2013, see here. Shortly before his death, the Canadian War Museum in Ottawa finally opened an exhibit that, for the first time, portrayed Canadian involvement in Spain in the 1930s, see here. For his part, when George Hill made it back to Canada he moved to British Columbia, married and raised a family. Though I don't recall much from my meeting with him in Vancouver the 1970's, I never forgot the story of how he had fought in Spain and was glad to recently find some of his war records online. Though criminalized by their own government, the men and women who went to fight in the 1930's responded, in many cases with their lives, to a danger that proved all too real with the start of World War II. One can't help wondering how different things might have been if the world had heeded their warnings. On Remembrance Day in 2017, I will give a moment of silence to think of all those who have fought and fallen, but this year I will also include a special prayer for the many Canadian veterans of the Spanish Civil War. In my opinion, so should we all.